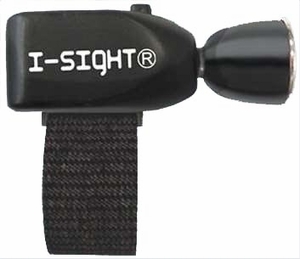 The I-Sight� Digit Light comes attached to a velcro� strap, and can be worn on your finger or thumb. Uses unlimited�� !! Operated off three AG10 batteries. Unit comes attached to velcro� finger/thumb strap. Light head swivels up and down, and unit swings from side to side, for full and exact light direction placement. Powerful Ultra-Bright Yellow LED lasts over 100,000 hours and is virtually unbreakable. Chromed reflective housing for maximum light intensity.